As 2017 nears its end and before our focus is drawn to whatever the new year might have in store, now is the perfect time to look back and reflect on the last twelve months on the Impact Blog. Editor Kieran Booluck reports on another year in which our readership has grown, and also shares a selection of the most popular posts to feature on the blog this year. As our recent series of annual round-ups amply demonstrates, we’ve featured a number of great posts on the Impact Blog this year. Covering the usual mix of academic writing advice, research summaries, open access commentary, and much more besides, we’ve recorded 1,412,929 pageviews in 2017, more than in any previous year! Again, this is most obviously a testament to the outstanding work of our excellent authors and I’d like to extend my thanks to each of them for their contributions over the last twelve months. Thanks also to our large community of readers and followers who have liked, commented on, and shared our posts on social media and beyond! 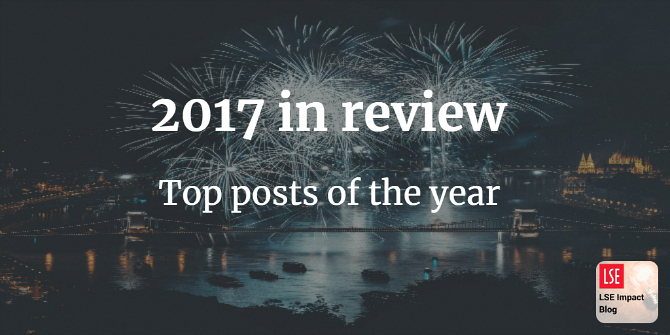 So, after reviewing all that has published I’m happy to reveal the dozen most popular posts of the year. This selection has been made based on Google Analytics data and covers a wide range of the blog’s various topics and themes. Posts are presented in chronological order; please just click through to view. Thanks again to all our authors and readers – see you in 2018! Before having your paper accepted for publication you’ll almost certainly be required to revise it at least once. For less experienced authors this may not feel so straightforward. Deborah Lupton has compiled a list of tips for authors who have been asked to revise their article. Remember that being exposed to critique is an inevitable part of academic writing, challenge yourself to improve your work, address all reviewer comments, and you’ll be ready to resubmit. Writing is crucial to an academic’s role of producing, shaping and distributing knowledge. However, academic writing itself is increasingly being shaped by the contemporary university’s managerial practices and evaluation frameworks. Sharon McCulloch describes how her research on academics’ writing practices has revealed tensions around the ways in which managerial practices interact with academics’ individual career goals, disciplinary values and sense of scholarly identity. Unpaywall, a web browser extension that links users directly to free full-text versions of research articles, was launched in April. Heather Piwowar and Jason Priem of Impactstory, the team behind Unpaywall, report on the successful pre-release phase, and explain how two decades of investment, a slew of new tools, and a flurry of new government mandates have helped build a powerful momentum behind green open access. Submitting to a journal is a fraught activity for authors. But why should this still be the case? James Hartley and Guillaume Cabanac argue that the process has always been complicated but can be improved. By adopting standardised templates and no longer insisting on articles being reformatted, the submission process can quickly be simplified. Researchers who have recently completed a PhD will inevitably be considering what route to take to publication. Terry Clague outlines some of the various options, offering an insight into what questions a publisher might ask when assessing a proposal for a research book. Would-be book authors are encouraged to be mindful of the significant and ongoing changes to the academic books market, with online discoverability of paramount importance. And when it comes to preparing the manuscript itself, there are a number of simple pointers that can help authors to effectively structure, write, and edit their work. It has become increasingly clear that prevailing academic incentive structures have a potentially damaging and distorting effect on the nature of academic debates. Portia Roelofs and Max Gallien use the example of a controversial recent journal publication to illustrate how deliberately provocative articles have the capacity to hack academia, to privilege clicks and attention over rigour in research. This is consistent with equally troubling trends in the wider news media; where equal prominence is seemingly always afforded to extreme opposing views, where actual progress in debates becomes impossible, and false dissent is created on issues which are overwhelmingly sites of academic consensus. The way institutions conceptualise doctoral candidates – as individuals without baggage, able to devote all their time to their research – has very real consequences for those who do not fit this profile. Marie-Alix Thouaille reports on recent research into the professional development behaviours and experiences of doctoral and early-career researchers. Findings reveal that many diverse factors, from funding status and caring responsibilities to the location of one’s institution, can contribute to PhD researchers experiencing highly unequal access to professional development opportunities. For what reasons do academics follow one another on Twitter? Robert Jäschke, Stephanie B. Linek and Christian P. Hoffmann analysed the Twitter activity of computer scientists and found that while the quality of information provided by a Twitter account is a key motive for following academic colleagues, there is also evidence of a career planning motive. As well as there being reciprocal following between users of the same academic status (except, remarkably, between PhD researchers), a form of strategic politeness can be observed whereby users follow those of higher academic status without necessarily being followed back. The emerging academic public sphere facilitated by Twitter is largely shaped by dynamics and hierarchies all too familiar to researchers struggling to plot their careers in academia. Academics are topping up their earnings by writing for “essay mill” sites which help students to cheat in their assignments. S. A. Mills was one of those academics and recounts the experience here; offering an insight into the allure of such opportunities for those either out of work or in precarious positions, as well as the transactional nature of working for these services and with their clients.